High pressure transducer for pressure testing applications with 4-20mA current loop or amplified voltage output signal available in pressure ranges from 0…4 bar (60 psi) up to 0…1000 bar (15,000 psi) gauge with a measurement accuracy of 0.1%. The TPSA precision high pressure transducer utilises a robust stainless steel 17-4 PH diaphragm with bonded foil strain gauges, and incorporates an innovative mechanical design which makes the sensor insensitive to tightening during installation. The TPSA precision high pressure transducer is suitable for applications that require high accuracy in dynamic hydraulic test systems. The TPSA high pressure transducer has a sensing element that is machined from one piece of 17-4ph Stainless Steel which results in a uniform structural lattice for higher mechanical integrity without the need for composite high precision welding. The sensing element is TIG welded to a specially designed pressure connector which isolates the sensing element from external mechanical stresses such as the ones induced when installing a pressure transducer. The sensing diaphragm of the TPSA hydraulic pressure transducers is typically 0.8-1.0mm thick which makes the diaphragm very strong and durable. A Wheatstone bridge arrangement of foil strain gauges are bonded to the reverse side of the diaphragm which are then connected to a signal conditioning PCB for rationalising the pressure transducers output. The TPSA high pressure transducer has a 4-20mA current loop, 5 or 10 volt output with pressure ranges from 0 to 4 bar (60 psi) up to 0 to 1000 bar (15,000 psi) and achieves a typical measurement accuracy of 0.1% full scale best straight line. 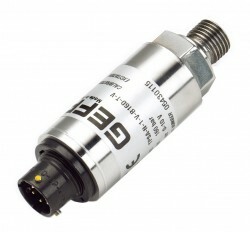 The TPSA high pressure transducer can be configured for most applications with a selection of electrical connections such as a DIN 43650 plug, M12 connector, Amphenol military bayonet style plug, Binder connector and integral cable gland. A complete choice of pressure connections are also available with G1/4 male or female, 1/8 or 1/4 NPT male or female, G1/2A male, M12 or M14 x 1.5 male and 7/16-20 UNF male or female. Hydraulic pressure test stands can be extremely unforgiving to some pressure transducers especially in highly dynamic systems which are testing hydraulic actuators or valves. In some hydraulic systems it maybe appropriate to combine all of the methods below to protect a pressure transducer but it is also worth carefully choosing the pressure sensing technology that is most suited to the punishing changes in pressure it will be subjected to as part of a high pressure test stand. The constant opening and closing of hydraulic valves can create large surges in pressure sending shockwaves through the system. If the most appropriate pressure sensing technology is not employed this can lead to irreparable damage to the sensing element. One method to protect a high pressure transducer in a hydraulic system is to fit a snubber or a restriction inside the pressure connection. A snubber is very effective in absorbing high frequency shock pressures, but there is a trade off with the dynamic response and over time the snubber or restriction could become blocked from a build up of contaminant particles. Another method to reduce the effect of hydraulic pressure spikes is to use a much higher range pressure transducer than you need so that its over-pressure rating is effectively increased. But this again leads to compromise in measurement performance which in this case is a combination of accuracy, signal to noise and lower output signal. Looking to measure pressure in a hydraulic system, the operating range is up to 400 bar, but I would like some safety factor on over pressure. A 400 bar range TPSA has an over-pressure rating of 1,200 bar, and a burst pressure rating of 2,000 bar. We need a 1000 bar pressure transmitter for high pressure application, with a cable electrical connection, and also a 1/2NPT male pressure connection, is it possible to provide the TPSA with a 1/2 NPT male connection, since I do not see that option on the data sheet? Yes it is possible to supply the TPSA with a 1/2 NPT male, which is a special option not mentioned on the standard data sheet. The optional part code for 1/2-14 NPT male is “J”. The TPSA description mentions that the sensor diaphragm is milled from a single piece of Stainless. Can you confirm that this means that the only material in contact with process fluid would be steel, or is there anything else, such as seals that would also be exposed? The wetted parts are all welded INOX 17-4PH Stainless Steel. If using the G1/4 male fitting you will need to use a dowty (bonded) seal which has an incorporated elastomer seal made from Nitrile, EPDM or Viton, but these can easily be replaced if they deteriorate over time. I am searching for an industrial pressure transmitter which is going to be used in hydraulic systems, and my requirements include an output signal of 4 – 20mA, accuracy of ±0.35% FSO, with non linearity & hysteresis less than 0.25% FSO, and a response time of better than 5 msec. The TPSA with a 500 bar range has a 3x overpressure rating and a response time which is less than 1 msec. What is the output resolution including noise levels for the TPSA with 0-10Vdc output? The TPSA has an analogue amplifier so there is no limit on resolution that you would normally see using a sensor with a digital amplifier. The noise level is around 5mV pk-pk. What is the position effect that I have noticed is specified on some data sheets such as the one for the TPSA? Most pressure sensors rely on the movement of a diaphragm to convert a change in pressure into an electrical signal. The size and mass of a pressure diaphragm will vary depending on the pressure range and technology utilised. Since the diaphragm is typically flat and thin, it will flex or sag under its own weight in certain orientations. The lower the pressure range the more sensitive the sensor will be to changes in orientation. In some types of pressure sensors there is also a sealed oil filled void behind an isolation diaphragm which protects the sensing diaphragm from exposure to corrosive media. An oil filled device will suffer from an additional position effect caused by the hydrostatic pressure of the volume of oil acting on the sensing diaphragm. Since the TPSA is a sensor for high range pressures with a relative thick stainless steel diaphragm and no oil-fill, there will be negligible affect on performance when changing it’s mounting position as stated in the specification data sheet. At what temperature is the TPSA pressure transducer calibrated? It is calibrated at 23 degC (room temperature) and the readings at zero and full scale are included on the production calibration report that accompanies the transducer. The temperature errors are also checked over the compensated temperature range of -10 to +85 degC to verify each transducer is inside the specification limits. What is the overall accuracy for the TPSA pressure transducer within the specified operating temperatures, is the total %FSO a summation of the accuracy and temperature effects, as well as long term stability? Non-Linearity, Hysteresis and Repeatability at room temperature = 0.15% FS BSL (~0.3% TSL) max. Temperature Effects for zero and span = 2 x 0.008%/degC x 95degC = 1.52% FS max. Total error over -10 to +85 DegC ~ +/- 1.82% FS max. If you null the zero and span offsets during installation this would be the total error. Also another error to consider is the long term stability of 0.1% FS/year, so after a period of 1 year the total uncertainty would be more like +/- 1.92% FS. 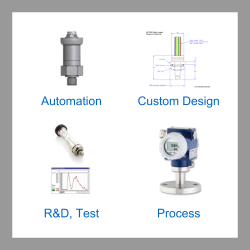 Please select the options you require for the TPSA Precision High Pressure Transducer in your application and request a quote. Send us your enquiry for TPSA Precision High Pressure Transducer to get assistance with this product type.